Are You Too Old to Go to Vet School? Are You Too Old for Vet School? There are many great reasons to become a vet, and thousands of students secure coveted vet school acceptance letters each year. While most veterinary students enter at “traditional” ages (i.e., the early twenties, within a year or two of completing their undergraduate degree), a small but significant number of “non-traditional” older students also achieve acceptance. These non-traditional students may have completed most or all of the prerequisite courses while obtaining their undergraduate degree, but either chose not to pursue veterinary medicine at that time or did not gain acceptance and moved on to other career opportunities. You may have heard that it's never too late to put an Animal Science degree back into play and apply to vet school, but is that really the case? Is it ever too late to go back to school and chase your dream? Let’s take a look at the statistics, pros, and cons of attending vet school as an older student. 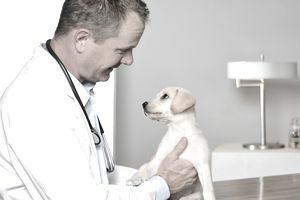 The American Association of Veterinary Medical Colleges (AAVMC) collected comprehensive data from all member colleges that used the VMCAS application service from 2009 to 2013. The survey included nearly all vet schools in the U.S. as well as several international schools. From a total of 6,766 applicants in 2013, a total of 4,959 students (73%) fell into the traditional 20–24-year-old age range. The 25–30-year-old age group accounted for about 16% of all vet school applicants, while the 31-and-older age group accounted for about 4% of applicants. That means a fifth of all vet school applicants fell in the “older student” range—not a huge number, but not insignificant. The UC Davis veterinary class of 2018 ranges in age from 20 to 53, and their 2019 class ranges in age from 19 to 42. Michigan State’s veterinary class of 2019 has students ranging in age from 19 to 33. Iowa State’s veterinary class of 2018 has students from 21 to 40 years of age. University of Minnesota’s veterinary class of 2019 has a student age range of 21 to 44. Purdue University’s veterinary class of 2018 has students ranging in age from 20 to 37. Older students develop leadership ability and real-world business skills while working full-time jobs. Older students tend to consider the commitment more carefully since it involves a major life change. Many schools accept prior college credits and degrees, especially if they were completed in the last five to eight years. Older students may have greater financial security than a new college graduate, enabling them to pay for all or part of their tuition. They are also more likely to have a spouse to rely on for financial and emotional support. Older students have less time to pay off potentially substantial veterinary student loans that can be in the six-figure range. Older students have less time to save for retirement and may face the added pressure of paying off student debt concurrently. Older students won’t be earning their usual salaries during vet school when they could have been earning significant amounts working in their prior full-time roles. Older students may find it difficult to gain the veterinary-related experience that makes an applicant attractive, particularly if they are working a full-time job in an unrelated field or have extensive family commitments. It really is never too late to pursue vet school if you truly have a desire to make it work. Older students should be fully cognizant of all the challenges that they will face. But they can take comfort from knowing that these challenges certainly haven’t stopped others in their 30s, 40s, and even 50s from seeking a new career in the field of veterinary medicine.